In the most recent study from the American Society for Aesthetic Plastic Surgery (ASAPS), the top five most performed procedures for women in 2009 were breast augmentation, liposuction, eyelid surgery, abdominoplasty, and breast reduction. 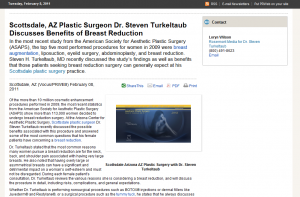 Steven H. Turkeltaub, MD recently discussed the study’s findings as well as benefits that those patients seeking breast reduction surgery can generally expect at his Scottsdale plastic surgery practice. Of the more than 10 million cosmetic enhancement procedures performed in 2009, the most recent statistics from the American Society for Aesthetic Plastic Surgery (ASAPS) show more than 113,000 women decided to undergo breast reduction surgery. At the Arizona Center for Aesthetic Plastic Surgery, Scottsdale plastic surgeon Dr. Steven Turkeltaub recently discussed the possible benefits associated with this procedure and answered some of the most common questions that his female patients have concerning a breast reduction. Dr. Turkeltaub stated that the most common reasons many women pursue a breast reduction are for the neck, back, and shoulder pain associated with having very large breasts. He also noted that having overly large or asymmetrical breasts can have a significant and detrimental impact on a woman’s self-esteem and must not be disregarded. During each female patient’s consultation, Dr. Turkeltaub reviews the various reasons she is considering a breast reduction, and will discuss the procedure in detail, including risks, complications, and general expectations. Whether Dr. Turkeltaub is performing nonsurgical procedures such as BOTOX ® injections or dermal fillers like Juvederm® and Restylane®, or a surgical procedure such as the tummy tuck, he states that he always discusses the various risks and benefits of each procedure as well as each patient’s own unique expectations and goals for their aesthetic enhancement. He notes that women considering a breast reduction tend to feel more comfortable knowing how common and effective the procedure is, as well as the extremely high satisfaction rate associated with the results. Dr. Turkeltaub adds that in over 23 years of practice, he has never had a patient express regret over their decision to undergo a breast reduction, with many actually stating they should have pursued the procedure years ago. Dr. Steven Turkeltaub earned his medical degree at the Boston University School of Medicine. He did his general surgery residency at the University of Miami/Jackson Memorial Hospital in Miami and the Northwestern Medical Center in Chicago. Dr. Turkeltaub then completed his plastic surgery residency at the University of Massachusetts Medical Center. He is a member of the American Society of Plastic Surgeons, the Arizona Society of Plastic and Reconstructive Surgeons and the Arizona Medical Association. Continuing education is extremely important to Dr. Turkeltaub and he attends several national symposiums and meetings each year to ensure he remains on the cutting-edge of the plastic surgery industry. The Arizona Center for Aesthetic Plastic Surgery has two locations: the Scottsdale Office is located at 10290 N. 92nd St. Suite 207 in Scottsdale, AZ 85258; the Glendale Office is located 18275 N. 59th Ave. in Bldg. E Suite 126 in Glendale, AZ 85308. Both offices can be reached at (480) 451-3000 or found online at https://www.turkeltaub.com/ or the Plastic Surgery Arizona – Dr. Steven Turkeltaub Facebook page.